Joseph was the first Kascinski in my family to come to America from Poland. He arrived by ship in 1914 in New York. He next traveled by train to Milwaukee. 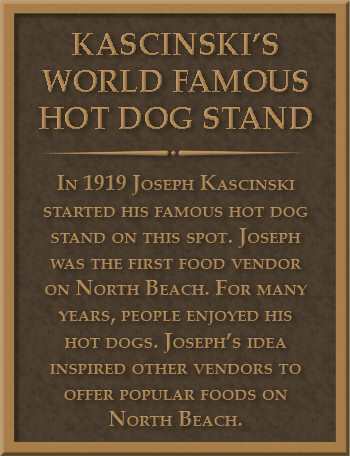 Joseph fought in World War I and then in 1919 started his own business, a hot dog stand along North Beach. He was the first food vendor there, and his success allowed him later to start two restaurants. Joseph’s hard work helped our family get started in America. It can be fun to honor a family member with a historical marker, too. (A historical marker honors a person or event and can be posted at an important site.) Here is a historical marker honoring Joseph Kascinski. Your Turn Write a family story and create a historical marker based on it. Identify a family story you would like to share. This could be a story from the past or present. If needed, ask a family member for help. Gather details about the story. Write your story. Answer the 5 W’s (who? what? when? where? and why?) about the person or event. Create a historical marker based on the story. Combine graphics and words on your marker. Be creative. Writing a Family Story and Historical Marker by Thoughtful Learning is licensed under a Creative Commons Attribution-NonCommercial-ShareAlike 4.0 International License. Based on a work at k12.thoughtfullearning.com/minilesson/writing-family-story-and-historical-marker.